Between taking care of my hubbie after his surgery, and cleaning the basement to make room for my new Long Arm Quilt Machine, I needed to take a break. 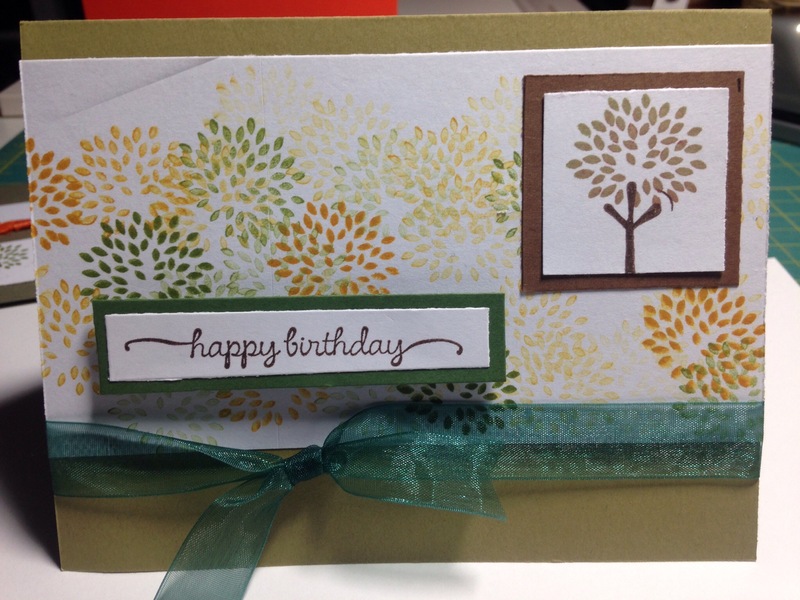 And I find that making cards can be such a rewarding, quick thing to make. Aren’t they darling…and so versitile! 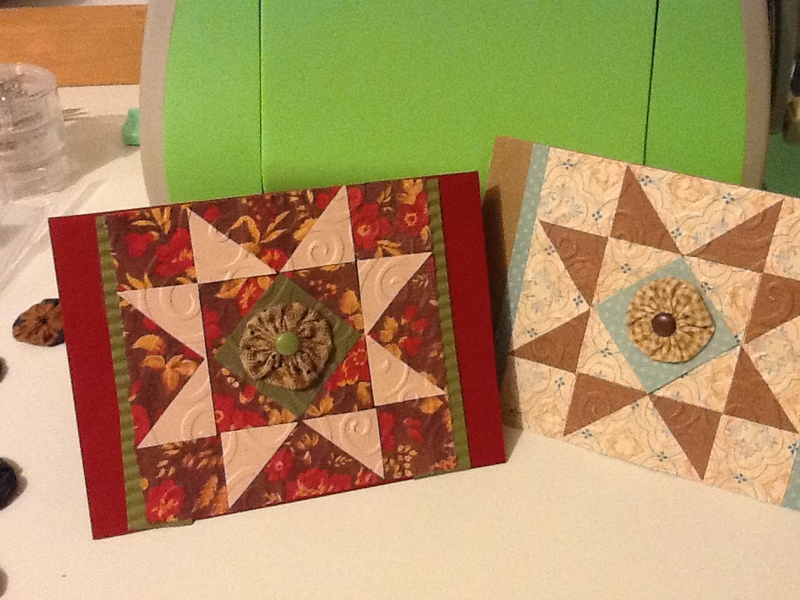 …to make a few “quilt square” cards! 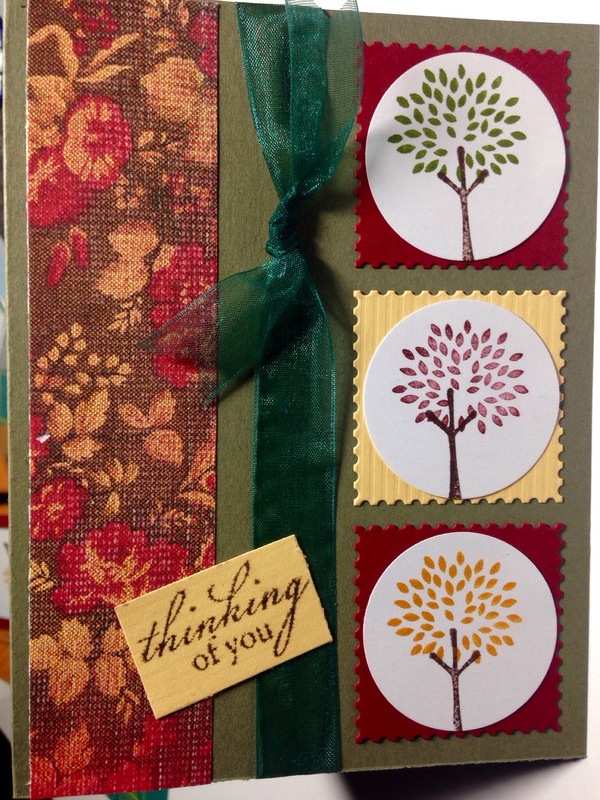 Kind of combining my love of quilting with my love of making cards! Note that I later ordered the “Thing-a-Ma-Jig” so my trunks & leaves would “line up” perfectly (see how much better they look in the first photo above). 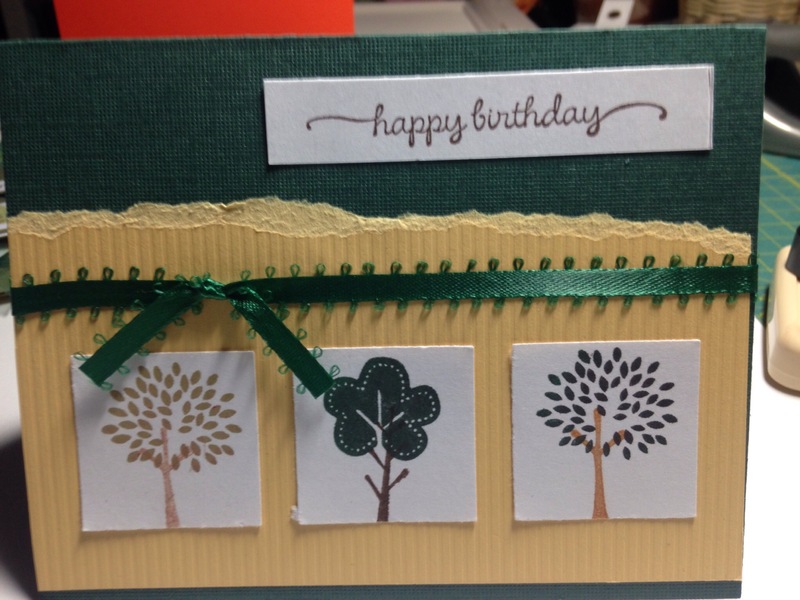 So in just a couple of days, I’ve got enough Birthday, Get Well, Thinking of You, and all occasion cards to last me quite awhile. 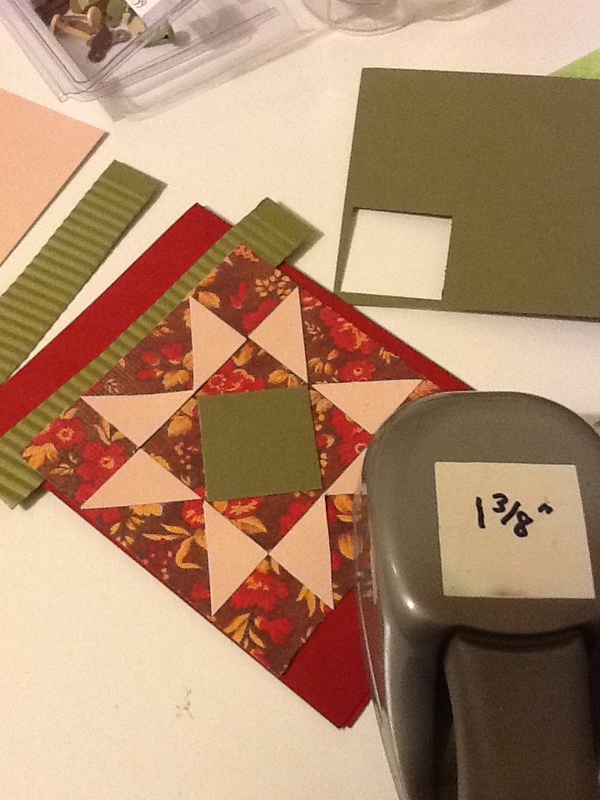 Scrapbooking and making cards is so much like quilting. 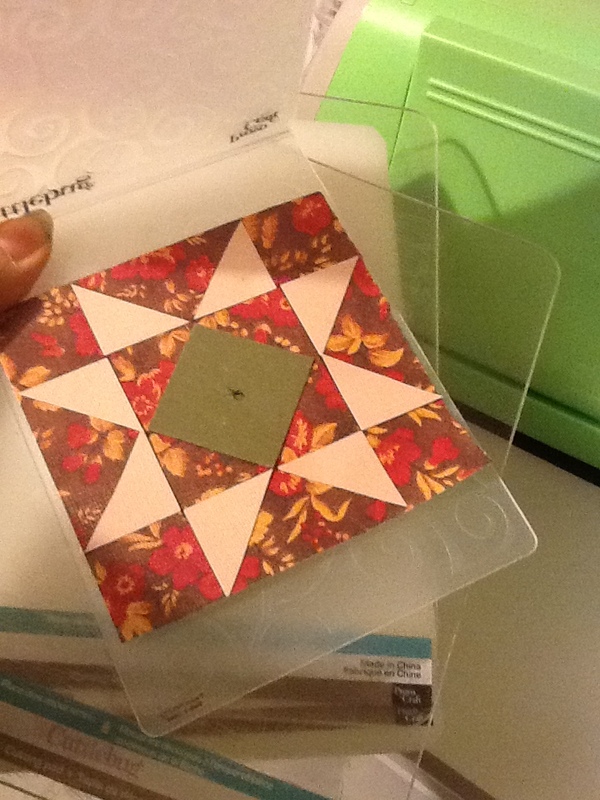 You cut paper (instead of fabric) into shapes with a paper cutter (instead of rotary blade), then glue instead of sew them back together. 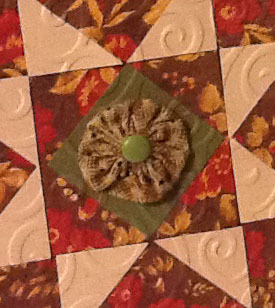 This “Ohio Star” quilt card is made from three coordinating papers, plus a left-over fabric yo-yo from another project. 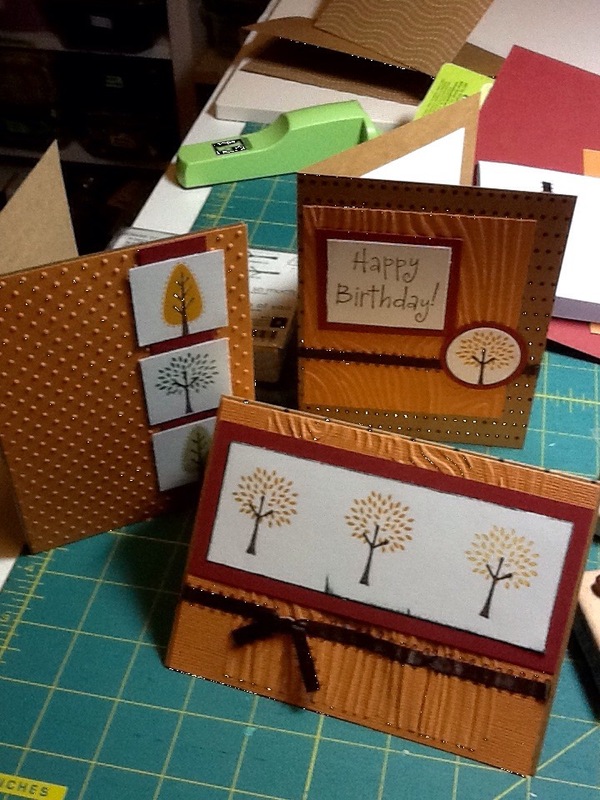 Start by cutting the background main card (brown) 5-1/2″ x 8″ & score to fold in half (5-1/2 x 4″). Cut a background (print paper) 4 x 4″ square. 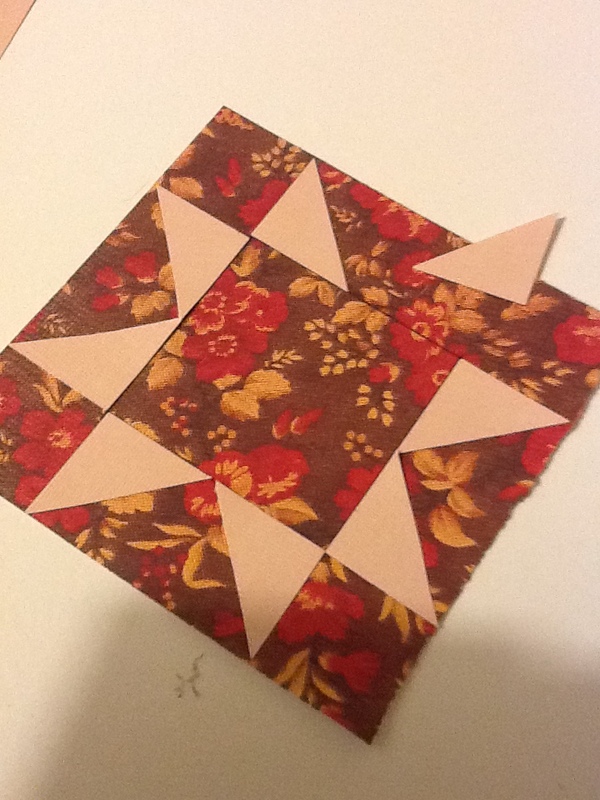 Out of a coordinating (but contrasting) paper, cut four 1″ squares (I used my 1″ square paper punch), then cut each in half from corner to corner–making 8 triangles. 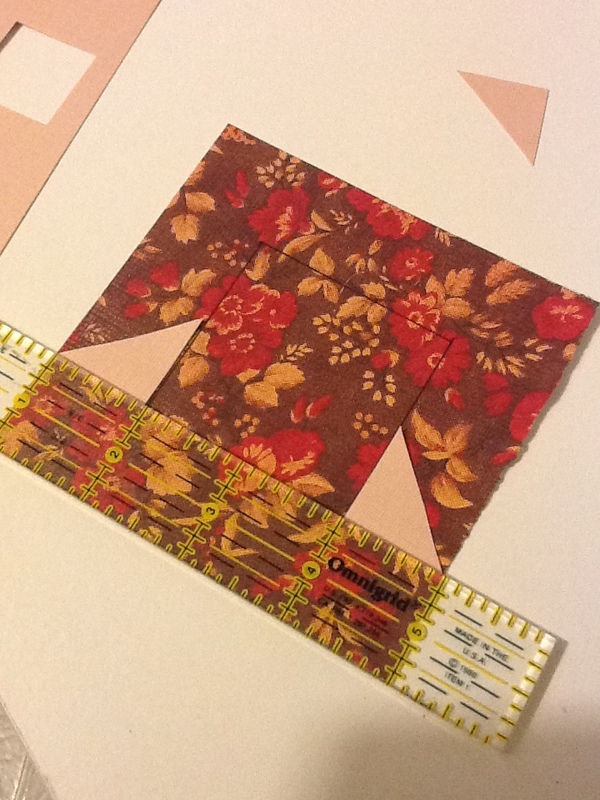 Using a 1″ ruler, mark a square 1″ from the outside border of your background (see photo above–this marking will be 3″ square) & begin pasting your triangles as shown, lining the long edge with the 1″ bottom, and the points at the outer edge of the print paper and center of each line. Continue all the way around, eye-balling to do the best job you can at matching up the points. 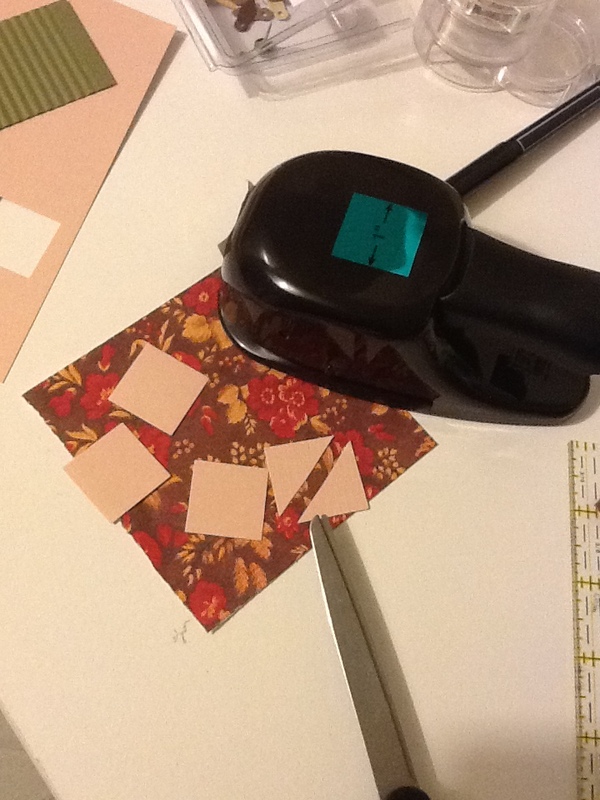 Then cut (from another coordinating paper) a 1-3/8″ square (I used my paper punch), and paste it in the center, on point. 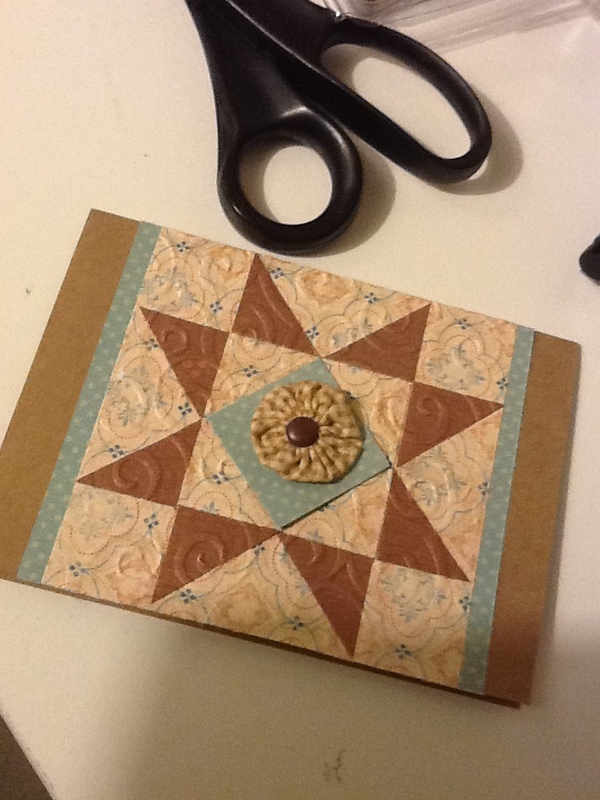 Locate the center of the on-point square & make a tiny hole (if you plan to use a brad later). 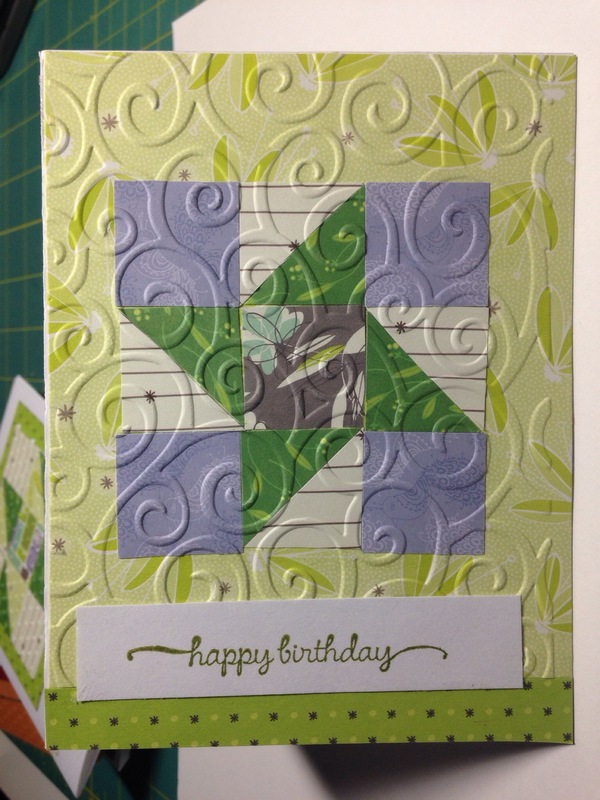 For added “quilted-like” texture, run it through a Cuddlebug embossing folder–I used a swirl pattern. I felt it still needed something extra in the center of the star…so I just happened to find some yo-yo’s that I had left over from another project and decided to attach one to the card with a coordinating brad. 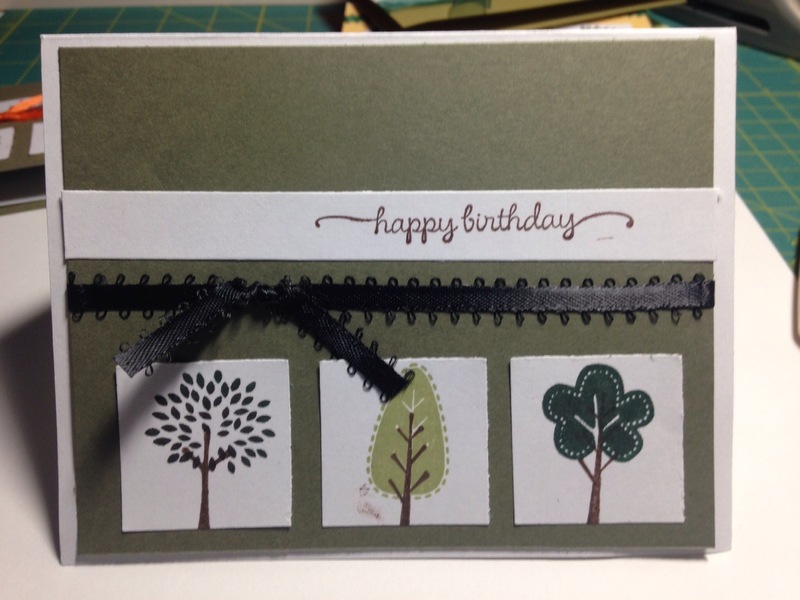 Finally add a strip of coordinating paper to either side of the 4″ square, and attach it to your base card with double-sided tape or your choice of glue. 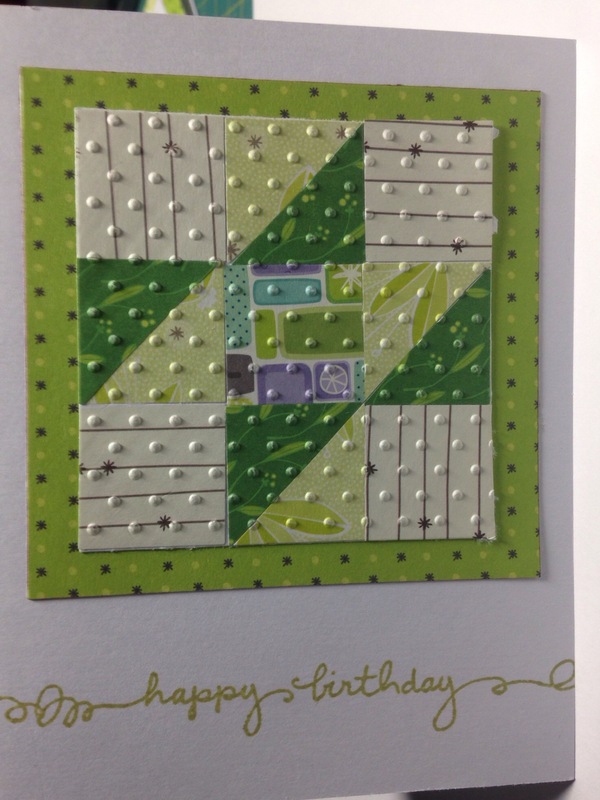 Happy Quilting–card quilting included too! Enjoy!